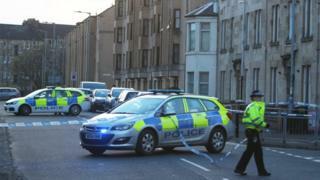 A man has been treated in hospital for serious injuries after being robbed in a street in Paisley. Police were called to the scene in Seedhill Road, near Lang Street, at about 19:20 on Saturday. The man was taken to the Queen Elizabeth University Hospital in Glasgow. A Police Scotland spokeswoman said inquiries into the robbery and assault were ongoing and officers were following a positive line of inquiry.